#408 , Nilgiri Block , Aditya Enclave , Near Mythrivanam , Ameerpet , Hyderabad - 500038. 9985943539. 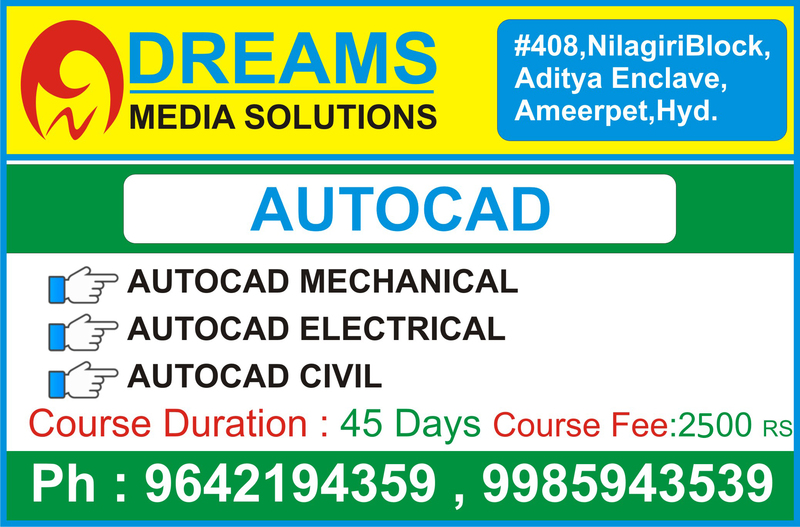 Dreams Media Solutions offers real-time and placement focused Autocad Training in Ameerpet Hyderabad.Autocad is a computer-aided drafting software program. By using Autocad we can create 2D, 3D drawings. We can use these drawings in construction and manufacturing . All Elecrical, Mechanical, Civil Students can learn Autocad Course . Autocad software is developed by Autodesk for transforming your ideas in the form of drawings on a system. The great advantage of taking Autocad training is that you can transform your ideas into drawings in remarkably less time. Autocad is in the market for a long time and has established its mark worldwide. So, irrespective of your location in the world Autocad training comes to help in your workplace. The software is very user friendly and the skills can be acquired very quickly and easily by taking Autocad Training from an experienced tutor. For Mechanical students Autocad Training helps to design machine drawings i.e Product design. You can make assembly drawings and part drawings. Models in 3d can be developed to understand the design better and check interferences. You can also use Autocad for working in projects wherein you can analyze any interference with drawings of other disciplines like electrical, civil, landscaping etc., and design piping and mechanical installations. Make plant design drawings. Civil engineers with the help of Autocad training can use Autocad for design of buildings. You can make 3d models of the buildings to convince the customers. Analyze aspects of lighting and the space requirements. You can also render and make catalogs to impress upon the customers. Autocad training comes in handy in projects wherein, you can coordinate and design with other engineers. Electrical engineers also upon completion of Autocad Training can do schematic diagrams, do product designing of appliances, electrical equipment. If happen to work in a construction project can do schematic electrical diagrams, do interference analysis. Make Bill of materials with ease for the purchase of standard electrical items. For complex system design they can take advanced Autocad electrical training to design control systems using equipment available readily in the market. 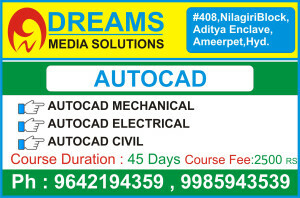 In Dreams Media Solutions, we are giving training in AutoCad. Mr.Srinivasa Rao has 18 years experience. After learning Autocad course, you can create scaled drawings that are used to manufacture equipment, plan infrastructure projects, design electrical circuitry, and build homes and commercial structures. Dreams Media Solutions warmly welcomes you to learn AutoCAD course. Normal Track: 45 Days, Fast Track: 1 Month. Autocad Training Course Fee: 2500 Rs.